European settlers were not responsible for thinning the gene pool of the Tasmanian devil, new research discussed over at The Conversation has found. 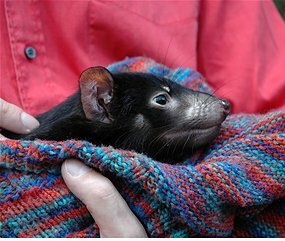 Tasmanian devils are currently under threat due to the spread of an aggressive facial tumour, one of only three recorded types of contagious cancer. The disease spreads so readily because genetic diversity in devils' immune systems is low. It is passed from devil to devil through biting. It had previously been assumed that this lack of diversity was due to population decline that occurred as a result of European settlement.